The humble white noise sweep is perhaps the longest-serving transition element in electronic music production, used in countless tracks through the years. It almost serves the same function as an elongated reverse cymbal, building in volume and intensity as - usually - a low-pass filter opens up as the sweep approaches its climax. However, the fact that 'common' white noise sweep behaviour can be described in words highlights the problem: we've heard this sound too often. The good news is that there are loads of ways to personalise such sweeps, and through the following steps, we'll explore some ways in which effects and automation can achieve great results. Don't copy us, though - armed with some inspiration, you can find your own take on this classic trick. For more on making effective transitions, check out the September edition of Future Music (FM308). Step 1: We're using Logic's ES 2 synth to provide our white noise, but any synth will do. We're using just a single white noise oscillator with all internal synth modulation switched off. We've got a low-pass filter opening up through the programmed note. Step 2: We've got a silent sidechain kick drum running through the track. We set up a compressor on the white noise channel and route the sidechain to it, to get the white noise pumping. We also set up an auto-panner to get the sweep moving from side to side. Step 3: We add two more touches to make our sweep a bit different. 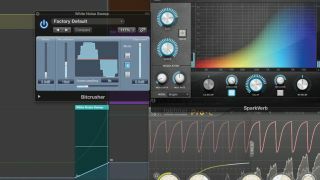 First, a long reverb from UVI's Sparkverb, then a second sidechained trigger compressor. Lastly, we add a bitcrusher with increasing down-sampling throughout the sweep's duration.